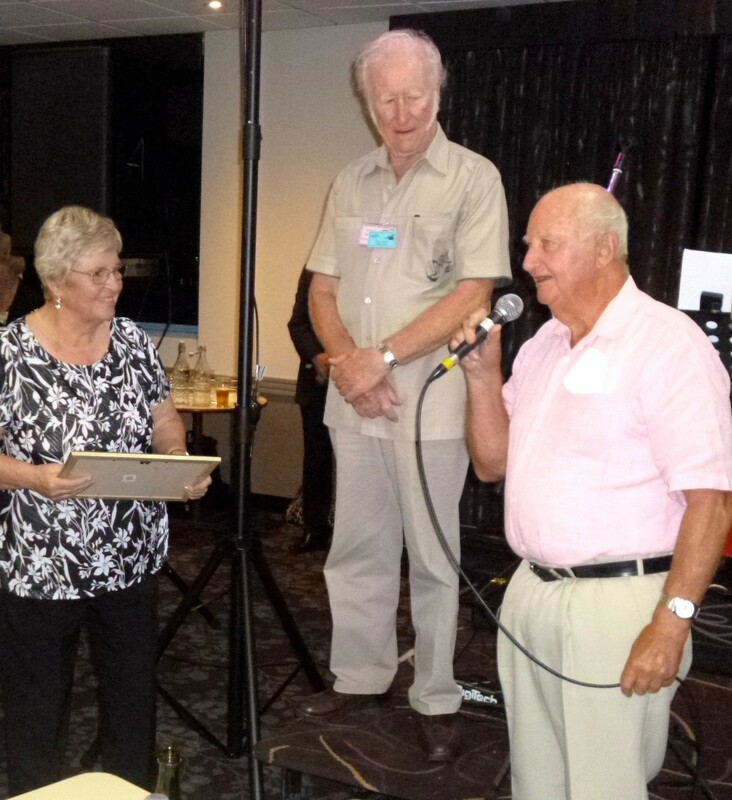 At their 2018 Christmas Jazz Night, the Down South Jazz Club presented locals Margie and Tony Fullerton with Life Membership. Margie and Tony Fullerton were two of the original jam session participants back in 1980, and they continuously attended the Merimbula Jazz Festival as representatives of Gippsland. They eventually migrated to Tura Beach in 1990, and linked up with Ken Vatcher in 1992. This trio became established in the Down South Jazz Club rhythm group, and became quite well recognised for their professionalism. It is because of their talent to support various artists from all over the country, that we as Jazz Lovers have been able to enjoy the huge variety of virtuosos at our monthly Jazz Gigs. Some of the artists that we have showcased here in Merimbula, for our enjoyment, include Tom Baker, Paul Furness, Bob Barnard, Johnny McCarthy, Alan Davey, Bob Henderson, Don Burrows, Ed Wilson and many more. Two musos from Sydney, namely Alan Solomon and Geoff Power, have made the trip to Merimbula 14 times during the era 2003 to 2016, using Margie, Tony and Ken as the rhythm section. These artists, and many more, came here because they were confident of being supported by talent of equal class. So, as we now see a slowing down of their activities, may we, as recipients of their music, acknowledge their contribution to Jazz in our ‘town by the sea’. Thank you Margie and Tony, for 38 years of entertaining our Jazz Lovers. The Down South Jazz Club is proud to present you with Life Membership. Click here to view the Thank-You letter from Margie and Tony.